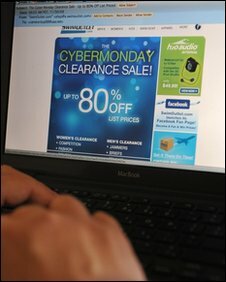 This Monday, 7 December, is being called "Cyber Monday". British shoppers are expected to spend £350m online, a record amount for a single day. But as they do so, consumers are being warned that they are more likely than ever to become the victims of online fraud and fake websites. Tony Neate, of Get Safe Online, is warning shoppers to scrutinise websites very carefully. "If we go down the high street, we'll quite happily hand over our credit card to a major high street brand," he says. "But go round the corner, and there's a guy selling something out of a suitcase. We're a bit more wary about what we buy off him. "It's exactly the same on the internet." If anything, the risks of shopping online are even greater than that. Not only is there a danger that you won't receive the goods you ordered, but the chances are your credit card details will be stolen, and sold on around the world. Earlier this week, the Metropolitan Police, with the help of the domain name organisation Nominet, closed down more than 1,200 websites using the .co.uk suffix. Among them were sites advertising brands such as Links of London, Tiffany jewellery, Ugg boots and GHD hair straighteners. But even before the police could make the official announcement about the closures, it looked as though some were already back up and running, using different domain names. One, pretending to be the upmarket jeweller Tiffany, appeared unable to spell the word jewellery. The problem is that anyone who registers a domain name ending in .co.uk or .org does not have to be honest about who they are or where they are. Is there an 's' after "http" in the address box? Nearly half a million .co.uk sites are registered abroad, often in China. If the site is closed down by the police, the criminals simply reconnect to their original website through a new domain name. "What they're doing is treating a symptom, rather than the problem itself," says cyber crime expert Rik Ferguson. "If we want the problem to go away, we need to enforce stricter controls." But Nominet, the organisation that distributes the .co.uk suffix, is against any such restrictions. There are several things a consumer can do to check that the website that he or she is buying from is genuine. First, does it have a phone number, and a postal address? When proceeding to the check-out, look at the address bar. If the URL begins with https, the chances are it is a secure site. S stands for secure. Http alone is not sufficient. Equally, a tiny padlock in the bottom right-hand corner of the screen, or at the end of the address bar, is a similar indication. If the padlock appears anywhere else on the site, it is likely to have been faked. Tony Neate also recommends using a single credit card for internet transactions. Not only is it easier to keep track of expenditure, but it also offers some protection if you buy goods for more than £100. In a recessionary year, everyone wants to retain the magic of Christmas, but at a bargain price. So no one is recommending avoiding the internet altogether. But the danger is that there may well be searching questions on Christmas morning as to whether that romantic necklace really is the genuine article. Or worse still, that the credit card bill brings some seasonal surprises in the New Year. Do surveys reflect our lifestyle? Do legal messages make a difference? Dangerous gifts found by UK trading standards officers.